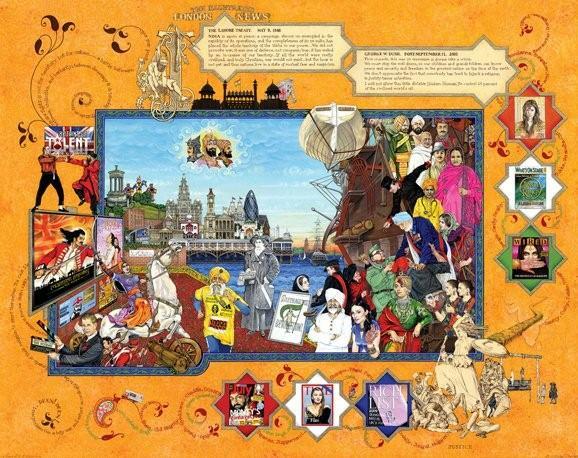 In this painting above, the famous artists the Singh Twins, who live in Liverpool England, were portraying the Sikh story of migration to Britain and integration, and depicting their very own celebrities. This is a true story expressed through art. Creativity has a very important role to play in bridging faiths, cultures and humanity and enabling us to live in peace and at the same time express the beauty and joy of difference. I was fortunate to be part of a very unique recent dialogue about Leadership and Cultural and Spiritual Education in Britain. The event was organised by FBFE, a charity of which I am Co-Chair, and the 157 Group - lead by Dr. John Wise and Dr. Lynne Segmore CBE respectively. Among the participants were education leaders and pioneers and Principals of Further Education colleges, with one principal, David Byrne of Barnet and Southgate Colleges, leading a group of 1,000 staff and 90,000 students and learners. One of the principal authors of these reports is a talented and visionary soul, Mary Myatt, who also Chaired our excellent workshop. Lots of ideas for transformation were discussed, and there was a strong collective will to give importance and priority to this critical area of soft skills development as it is a key to a rounded, wholesome and successful future. I personally felt strongly about the use of creative approaches in this whole area - like visual art, music, theatre, film, festivals and cross-cultural events as a way of building peace in our own schools, colleges and neighbourhoods. So much of education today has become functional and materialistic, with quite damaging impacts on the souls of learners. Is it any wonder that we have such significant mental and emotional health problems today? There was a strong feeling that spirituality is so often misunderstood by leaders, and for some leaders, it is the crucial resource from which their whole passion, determination, courage and strength springs. We were all talking about public education, where the aim is not to profit but to share, give and strengthen society. Commercial viability is important but it is not the be all and end all of education, which is sbout much more than profit. I found the whole experience of being in the company of such leaders very uplifting and inspiring. It is rare to see people upholding their values in spite of the system, and wanting to make a difference, in this case through their leadership roles and responsibilities. The present government has done much to cut and damage the FE sector, as they have done with so many public institutions, but these leaders have battled on, and are keen to do that which makes a sustainable difference. What is your view and experience - please comment below.